"The usual filling is feta cheese; this version calls for smoked Gouda and Emmenthal. If you have never worked with phyllo before, know that it is very fragile and must be kept covered or it will dry out very quickly. This is labor-intensive, but worth it. I like to divide the filling ahead of time into 48 equal little portions to ensure that all the borek are uniform in size. This may be made a day before they are baked, and stored covered in the refrigerator." In a medium bowl, whisk together egg, parsley, garlic and crushed red pepper. Mix in Gouda and Emmentaler. One sheet at a time, place phyllo dough on a flat surface and brush with about 1 tablespoon butter. Cut lengthwise into 4 strips. Place a rounded teaspoon of the egg mixture at one end of each strip. Fold corner of strip over the filling, forming a triangular fold. Continue folding the length of the strip in triangular folds to form a small stuffed triangle. Repeat with remaining phyllo dough. Preheat oven to 350 degrees F (175 degrees C). Lightly butter a large baking sheet. 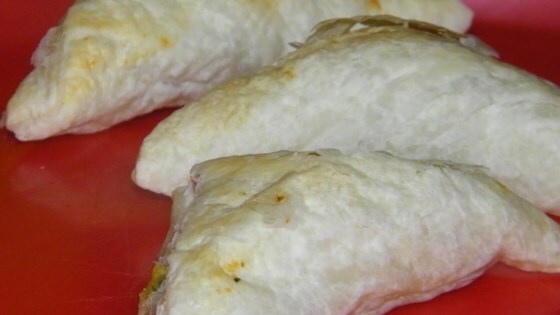 Arrange stuffed phyllo triangles in a single layer on the prepared baking sheet. Bake in the preheated oven 30 minutes, or until lightly browned. Serve warm. Easy skillet pancake full of savory flavors! I thought this recipe was great! I took it to my father's 60th birthday celebration and it was gone in no time. Thanks for the new recipe!